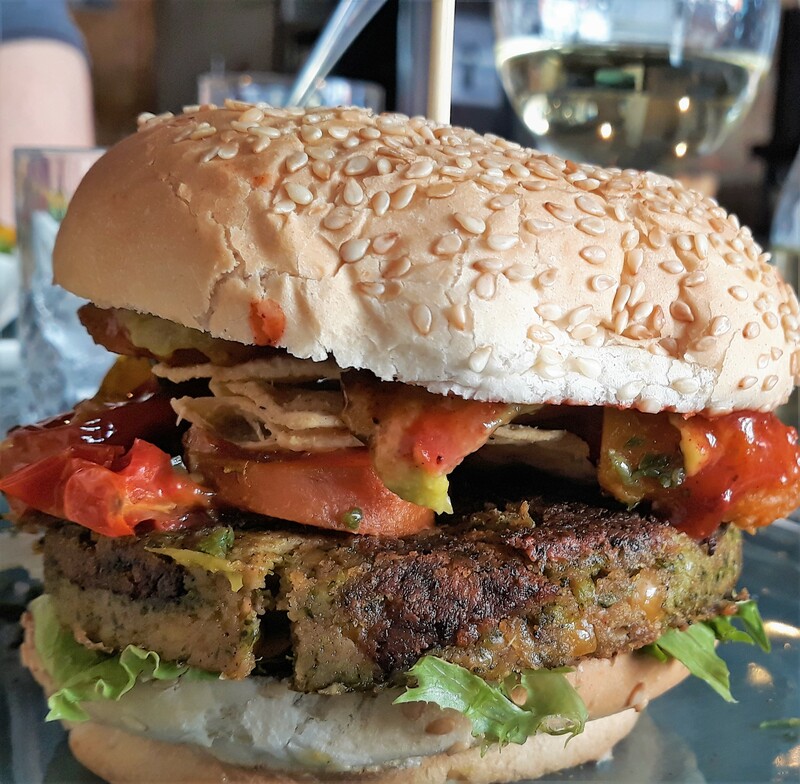 It’s not difficult to find vegan burgers in Cape Town – they are actually almost around every corner these days. 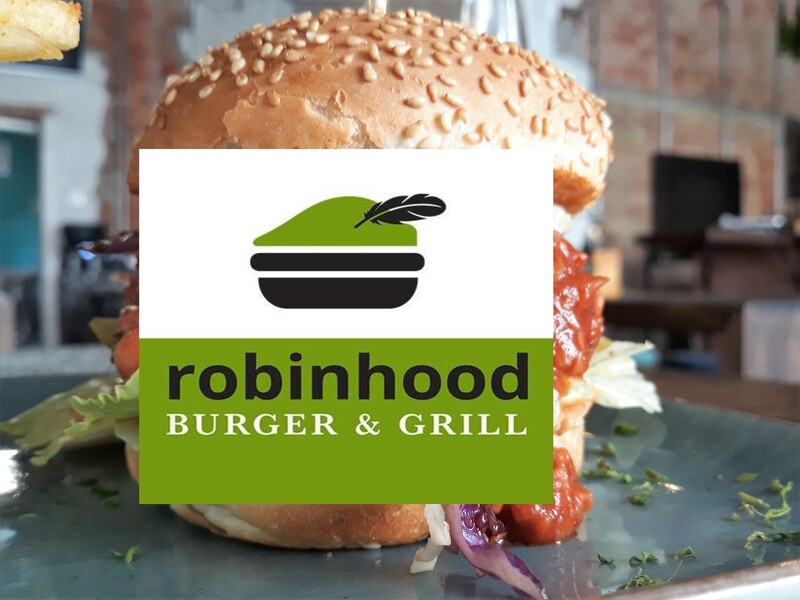 If you are looking for a really cool burger grill to hang out with your friends after work or on weekends, I recommend you check out Robin Hood Burger Grill on vibey Kloof Street in Gardens. I happen to know the owner and when I heard that he is behind the opening of Robin Hood, my first thought was: this has to be good. Well, all my expectations were met on the first visit. 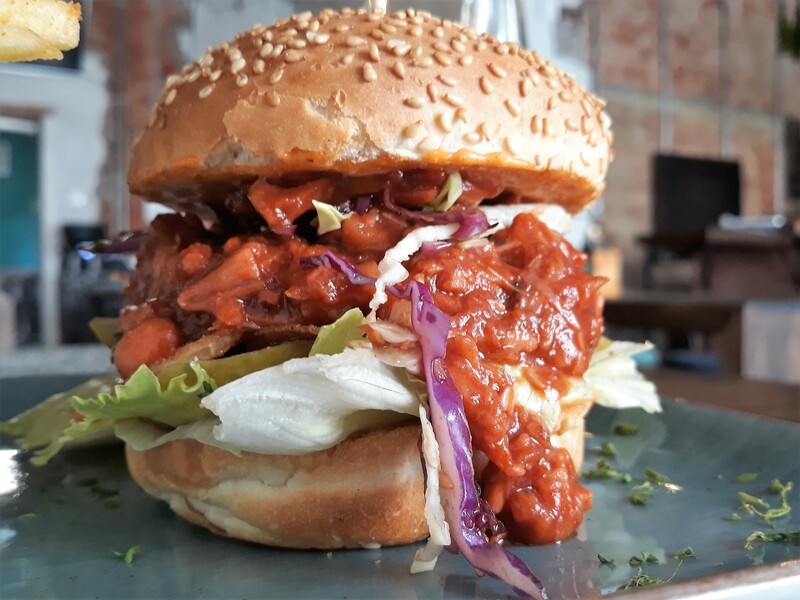 Kloof Street is full of burger restaurants, but Robin Hood is your authentic burger joint with a cool and trendy décor plus amazing menu options. Students will be very happy about the students specials. The menu boasts ‘normal’, vegetarian and four vegan handcrafted burgers, which makes it a great place if you eat out with your ‘carnivore’ friends or colleagues. I was happy to learn that the vegetarian and vegan burgers are handmade from scratch and that plant-based diners are looked after well. Only 100% fresh vegetables and fruits are used for the yummy vegan burgers without having to worry where it comes from or where it’s been. All produce are locally sourced and organically farmed, giving all meals just that extra bit of taste and love. Proudly grown and cooked right here in Cape Town! This delicious vegan burger substitutes meat with Jack Fruit, topped with an Asian Marinated Coleslaw. Even if you’re a meat eater, you’ve got to try this one. I dined at Robin Hood twice and can give you my honest feedback on two burgers. The one time I had the jackfruit burger, which was absolutely amazing. It was as good as it looks on the picture and the jackfruit is marinated in a spicy sauce. On the first bite, the sauce seems very hot, but don’t worry, the coleslaw takes away the spicy note and balances it out nicely. This was honestly one of the best burgers I’ve ever had and will definitely order that again. Try it out for yourself – it’s not your usual patty but definitely worth a try, especially if you love jackfruit like me. The other burger I tried was the Vegan Maiden Of The Blue Boar. This Mexican style burger comes with all the trimmings. A plant-based broccoli and chickpea patty and delicious Mexican elements. I loved the combination of the BBQ sauce, chilli veg and of course the guacamole and crunchy nachos. Your taste buds will enjoy this fiesta of flavours. The drinks menu at Robin Hood offers a variety of wines, cocktails, craft beers and spritzers and numerous homemade lemonades to quench your thirst. I tried the Cape Apple Spritzer, which strongly reminded me of the German ‘Apfelschorle’. This is the perfect refreshing drink on a hot day in Cape Town. Do yourself a favour and leave some space for dessert. 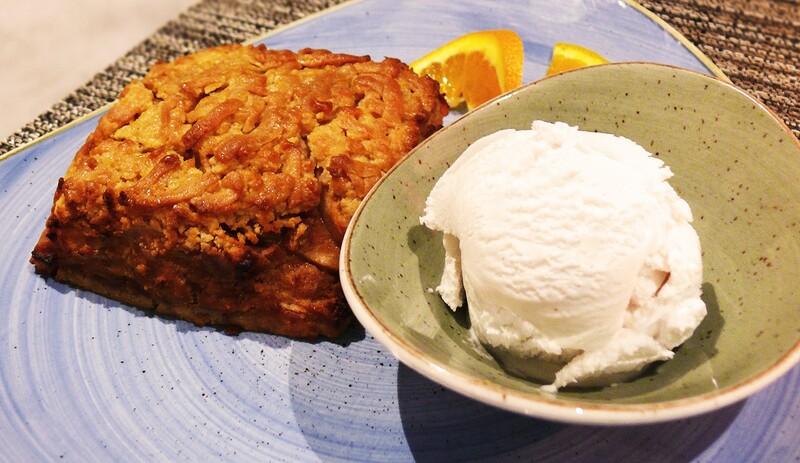 Yes, you read correctly, Robin Hood caters for vegans all the way and offers a vegan apple pie with vegan ice cream for dessert. DELICIOUS! In case that you really are too full for a slice of cake (there’s always a next time), why not order some of the Dervish Nosh pralines with some tea or coffee? 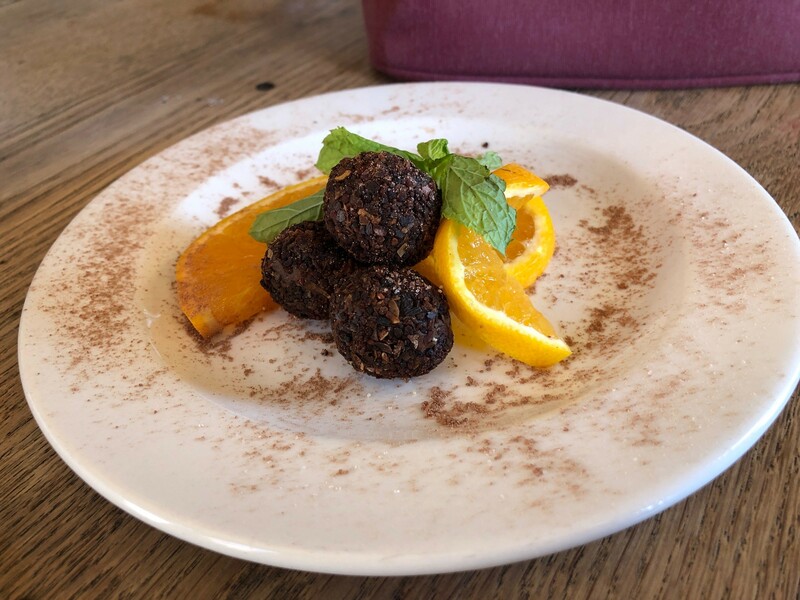 Dervish Nosh is a vegan and healthy sweet treat. My verdict; Robin Hood is a casual restaurant that satisfies your vegan burger cravings and offers a vibey ambiance to hang out with your folks (vegan or not). Just remember that the burger patties here are completely made from scratch and prepared with a twist. Alone the drinks menu is worth a visit and the specials are something to look out for. Try the jackfruit burger and thank me later. Disclaimer: I’ve been hosted by Robin Hood Burger Grill to test the vegan options. All opinions given in this article are my own.